Are bodybuilders becoming too large? It’s a simple question but one loaded with controversy. Today most Internet forums are filled with heated arguments about whether the ‘mass monsters’ of today are helping or hurting the sport. Rather than continue the common narrative that the 1990s and the Dorian Yates era was the dawn of the ‘Mass Monsters’, today’s post argues that bodybuilders and their forerunners have always taken their physiques to the extremes of their time. In other words, bodybuilders regardless of the decade, have always displayed bodies well beyond the reach of the common man.The bodybuilders of today who stand tall and wide are rather than damaging the sport, continuing the tradition of freakish bodily appearances. After all, Bodybuilding has always judged physiques based on the best combination of size, shape, symmetry and conditioning. With this framework in mind, let’s examine the freaks of bodybuilding past. 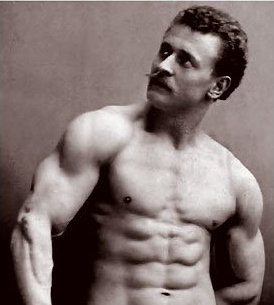 It may come as a surprise to see Eugen Sandow (1867-1925), the man many consider as the father of modern day bodybuilding, labeled as a ‘mass monster’. What needs to be considered is the face that Sandow’s physique, modeled on the Greco-Roman statues of yore showcased a highly conditioned upper body unattainable by the vast majority of the public. It’s arguable that Sandow’s popularity was predicated on the fact that his physique was out of the ordinary and something mere mortals could only dream of. Something often forgotten by the public today is that for all his popularity, Sandow’s physique was criticized in certain quarters for being freakishly large and ungainly, a criticism that still resonates in the sport today. But it’s not just Sandow who can be considered freakish for his time. As bodybuilding grew over the decades, the next physique to make a major impact with the general public was Steve Reeves, the 1950 Mr. Universe. Reeves broke into the zeitgeist thanks to his appearances in the Hercules movies of the late 1950s. Without doubt Reeves’s combination of wide shoulders, small waist and well developed thighs, set the standard for the definitive bodybuilding physique. Indeed following Reeves, men such as Reg Park, Bill Pearl, Dave Draper and Gironda trainee Larry Scott dominated the bodybuilding community. These men came to prominence because their physiques were unmatched in terms of the size and conditioning of the time and they too were considered freakish, not just amongst the general public but also within the sport of bodybuilding itself. Despite the fact that when compared to the physiques of today’s champions such men appear small, they were without doubt the mass monsters and ‘freaks’ of their time. The 1960s were a monumental time for bodybuilding in more ways than one. Knowledge of food and nutrition was improving, steroids had infiltrated the sport and physiques were growing ever larger, with none larger than that of Sergio Oliva. Bigger than anyone who came before him, Oliva boasted small waistline and indescribably wide shoulders. His silhouette showcased Lats so wide, they earned him the title of ‘The Myth’ because anyone who saw them in the flesh couldn’t believe their eyes. Sergio dominated bodybuilding for years before the Austrian Oak, Arnold Schwarzenegger, took his crown. Taller and bigger than Sergio, Arnold managed to dethrone the Myth by contorting his physique in such a way as to present an aesthetic image. Take the famous Arnold Three Quarter pose that displayed Arnold’s raw muscle size while still emphasizing a thin waistline. The physiques of Arnold’s time were cut of a similar cloth in the sense that all emphased thick muscularity and aesthetic tapers. Men like Columbu, Ferrigno and Mentzer amongst others were all classed as mass monsters alongside Arnold. Even Frank Zane, the man held up as the epitome of aesthetics in bodybuilding had his own Sandow-esque freakishness. Zane’s symmetry and shape was undoubtedly beyond comparison with his compatriots. Despite his relatively light stage weight, Zane would wow judges and audiences alike with his impressive conditioning and control over his muscles. The patented Zane stomach vacuum is testament to this. The decade following Arnold, Zane and co saw the likes of Gaspari, Platz and Haney take the lessons of their predecessors, namely size and conditioning to even more extreme levels. In 1984, bodybuilding was introduced to the first ‘mass monster’ as modern day commentators would know the term. The man responsible for the switch was Lee Haney, the 5ft 11 200 pound plus bodybuilder who came to dominate the 1980s bodybuilding scene. Weighing more than Schwarzenegger, Haney regularly came on stage weighing in at a lean 248 pounds. Haney’s small bone structure and shoulder girth saw his win an incredible 8 Mr. Olympias. Following Haney came Dorian Yates. A proponent of the High Intensity Interval Training advocated by Mentzer and Arthur Jones, Yates was the first Mr. Olympia to come onstage weighing over 250 pounds with super low body fat. Interestingly it was Yates that former Mr. Olympia Arnold Schwarzenegger signaled out for being too large and disproportionate to be a bodybuilding champion. The Austrian Oak accused Yates of sacrificing size for aesthetics, becoming freakish as a result. Arnold’s criticisms have influenced much of the narrative revolving around bodybuilding as many date the beginning of the Mass Monster period with Yates. This, in the author’s opinion (everyone’s got one right?) is a completely unfair accusation. As shown by our brief walk down memory lane, bodybuilders have always strived towards the freakish due to their relentless drive to push the limits of the human physique. Whilst the influx of steroids into the sport has undoubtedly brought a litany of health risks with it, the desire to become bigger and leaner has always existed. The only difference nowadays is that the athletes are much larger. It’s funny how in the mid 90s Arnold came out lambasting the likes of Yates for his “disproportionate size” and now, 20 years later, doing the same thing again with this generation. Not without reason I understand, but compared to today’s mass monsters, Yates and his contemporaries were downright aesthetic! The Arnold Yates debate is fascinating isn’t it? Dorian has some great videos looking back on it. As you say compared to today such men were aesthetic…scary to think what will be the future in another 20 years! Remember he competed in the early ’50’s so by the standards of those times it was all about upper body. Hi Reilly, that’s a very good point that I hadn’t considered. My focus on overall size blinded me on that point!